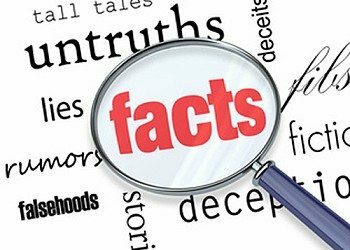 The Media Research Center (MRC) on Tuesday announced its new project Fact-Checking the Fact-Checkers. As major news outlets increasingly rely on leftist “fact-checkers” to verify the credibility of news, the MRC will ensure the fact-checkers themselves are reliable, or exposed as liberal partisans if they aren't. While fact-checking the accuracy of news is needed, often it is used as a medium to push a political agenda. Many fact-checking groups routinely cast judgments while failing to disclose their own liberal bias, and the public is on to it. According to a 2016 Rasmussen poll, an astonishing 62 percent of American votersbelieve fact-checkers are biased. Some of the fact-checkers the MRC will monitor include PolitiFact.com, FactCheck.org, Snopes.com, Washington Post Fact Checker, AP Fact Check & CNN Fact Check. If only the MRC was as concerned with the accuracy of the work on its own website as it is with those of fact-checkers. We've documented how the MRC promoted false stories, then refused to correct the record when they were proven false -- the purportedly imminent indictment of Hillary Clinton just before the 2016 presidential election, the bogus claim that CNN was scripting questions at a CNN debate, the death of a Border Patrol agent that turned out not to be at the hands of an illegal immigrant, an undocumented immigrant arrested on smuggling charges that were later dropped. If the MRC can't be bothered to hold its own work to basic standards of accuracy, what moral standing does it have to fact-check anyone else? Ther thing is, this isn't about the truth -- it's about trying to score political points. As a kneejerk supporter of a constantly lying President Trump, the MRC has been trying to delegitimize fact-checkers for a while now. The posts made after the March 27 announcement of the project -- all of which are written by Tim Graham -- further prove its partisan political intent. Graham whined about a fact-check into whether Vice President Mike Pence called his wife "Mother" because it was somehow biased and trivial: "So if you can’t prove something is factual, why write about it? Aren’t the 'fact checkers' just spreading an unverified tale, publishing clickbait for Pence haters?" He huffed "This article is unverified gossip -- hardly something 'PolitiFact' should be proud to publish." Graham then complained that another fact-check -- on a caravan of immigrants heading for the U.S. border -- was too nit-picky because it focused on "two words in a Trump tweet." He added -- without documentation -- that "Trump's brief tweet shouldn't have to say 'Caravans' coming each year' to be recognized as factual. Multiple caravans have been launched at the U.S. border." Graham rated both of these fact-checks "deeply distorted" -- a statement that's nebulous to the point of meaninglessness. But that's how the MRC rolls. Real journalists check facts; partisan activists attack the fact-checkers.